Almost two years after enacting the state’s Smoke-Free Restaurants and Bars Law, health officials are noting a double-digit decline in the number of emergency room visits by North Carolinians experiencing heart attacks. The study released Wednesday by the North Carolina Division of Public Health shows a 21% decline in the heart attack hospitalization rate since the law went into effect in January of 2010. “The study adds to the clear body of evidence that North Carolina’s smoke-free restaurants and bars law not only makes dining out more pleasant, but saves lives and improves health. For years, the US Surgeon General has warned that there is no safe level of exposure to second hand smoke and that as little as 30 minutes of exposure can trigger a heart attack in patients who have heart disease or risk factors for heart disease,” noted Pam Seamans with the NC Alliance for Health. State Health Director Dr. Jeffrey Engel estimates the decline in heart attacks in North Carolina in 2010 represents $3.3 to $4.8 million in health care cost savings. Bullsh**. If you don’t want second hand smoke, don’t go to a bar. 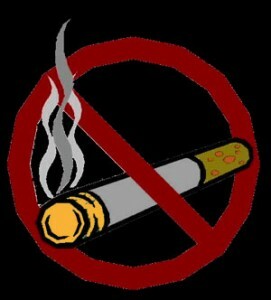 Seems pretty simple to me, a non-smoker.